Going into zebra state of mind for this Spring/Summer season? Yes, please. Stripes seem to be a very essential part of Summer. A mix of zebra, sailor's influence and geometry this print or pattern you name it never goes out of our Summer-y wardrobes. This season stripes are still with us thanks to designers, who keep interpreting the print in every way possible. While designers like Domenico Dolce and Stefano Gabbana, simply Dolce & Gabbana, are keeping it classy in black and white colors and more sailor looking influence, Olivier Rousteing of Balmain brings us more lively lines, but Maria Grazia Chiuri and Pierpaolo Piccioli from Valentino, in turn, took stripes to a more geometry meets rainbow level. Blurred or no lines, aka stripes, are taking us through the long awaited sunny-days season. 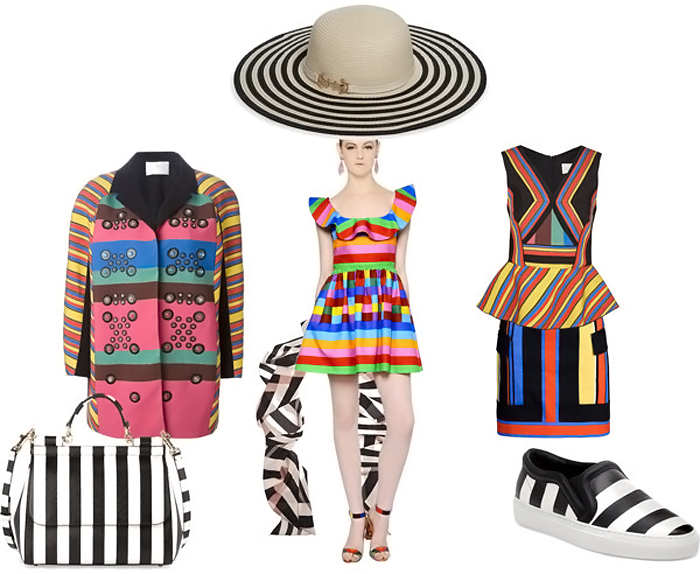 So join our virtual tour around the coolest stripe-full pieces. While clothes are in general made with the reason to protect our bodies, outerwear plays the role of a safeguard who saves us from cold and rain. Therefore, light coat or trench coat all covered in stripes can a good idea. Plus you can actually wear such a piece of outerwear as a proper coat-dress, i.e. without proper clothes, like pants or midi/maxi skirts, underneath. Striped dress is always good. Remember the number one stripe rule - horizontals will visually add you some weight, while verticals will make you look slender and will even add you some height, in visual terms of course. But we all know that rules are made to be broken, so it takes certain fabrics, colors and even stripe width to find out whether horizontal stripes are made for you or no. Despite all other clothing garments striped tops look like a designer case study about animals, directly zebra, geometry, rainbows and even a bit of musical notation. Therefore, it's your turn to go into this kind of study and pick your favorites. So go on! Huge tribute to those who brought pants to female armory, both the creators and brave women who were first to bring it in public. Today we have so many choice of striped bottoms, ladies! It's not only about skirts and shorts, it's also about all sort of pants including trending flares and culottes. We can't be more thankful for that, aren't we?